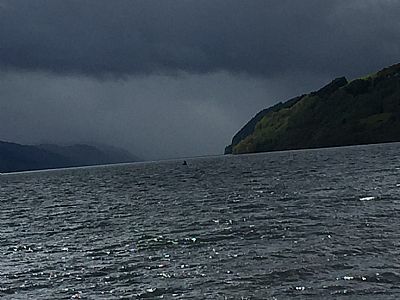 Here are the sightings of something unexplained in Loch Ness reported since 2000 - you'll see that it's not just grainy old black and white pictures that exist of our favourite creature! 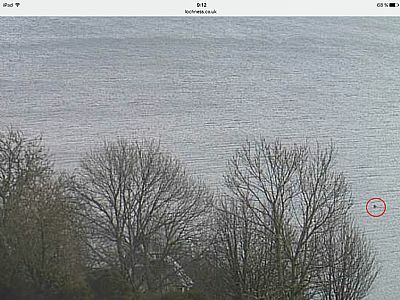 22 March - again, regular webcam watcher Eoin O Faodhagain took 6 photos and 39 second video of something moving rapidly on the livecam at 16.53 on the surface then submerging, then gone for 5 seconds then up again on the surface going another direction turning about leaving a wake and splashes. It then then submerged and disappeared. 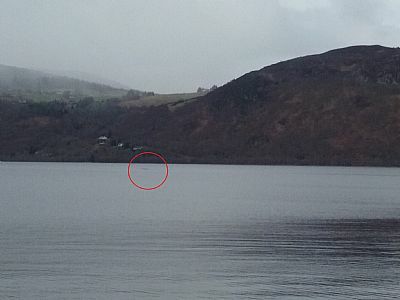 23 February - a visitor from Manchester took the picture below of something unexplained in Urquhart bay at 3.12pm . She said the dark coloured creature rose about 3 feet out of the water for about 10-15 seconds before disappearing back under the surface. 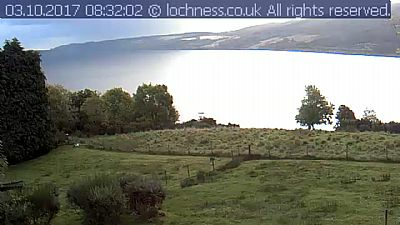 19 December - Caroline Barnett from the south west of England was watching the Loch Ness Webcam at 10.20 when she saw someting move slowly up the loch. Initially she thought it was a boat or similar but the object appeared animate and then disappeared into th water before reappearing. It was dark in colour and nearer the east shore of the loch. 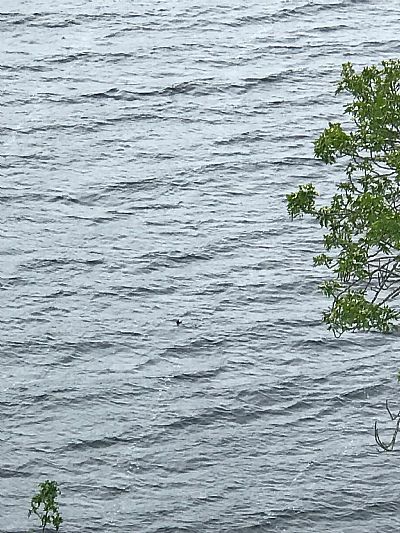 22 November - a visitor from the United States saw a dark green (almost appeared black) object protruding from the water, at about 4.5 feet in height, slowly moving farther from shore. There was no boat traffic and the sighting lasted about 30 seconds. 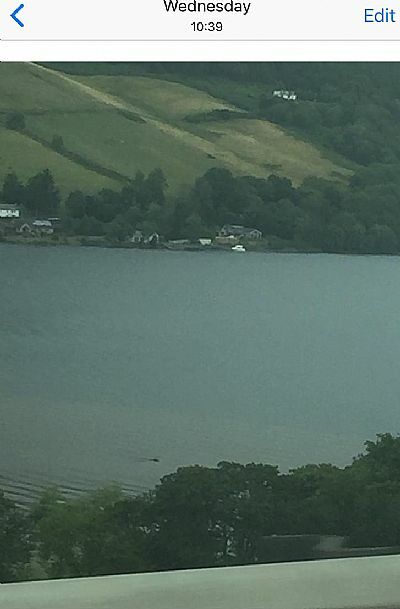 5 August - At 9.38am Marylin and her family, regular visitors to the area, were on holiday from Leeds travelling from Drumnadrochit to Fort Augustus when they looked out at the loch and spotted a strange looking lump on the surface of the water, which was very still and quiet at the time. It looked dark brown in colour and 'sort of like an upturned boat'. They revisited the area by boat in the afternoon and there was nothing like that in that area. Unfortunately because they were driving and couldn’t pull in, they didn’t manage to get any pictures. 26 July - Miss Coghlan, visiting the area with her family from Norfolk, reportedseeing a greyish blue creature with a hump and head about half a mile out in the loch. The sighting took place from the A82 road near Bunloit at 3pm. 28 May - Morag Connor and her friend were driving north out of Drumnadrochit between 11 and 11.30 am. 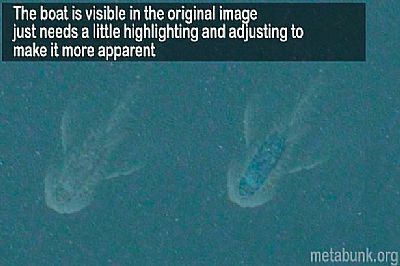 They saw a creature with a long neck with some humps behind it sticking about 7-8 feet out of the water and about 50 m from the shore. The creature had an all dark body but with no discernible head. They were unable to stop as they were driving and there was no place to pull over. 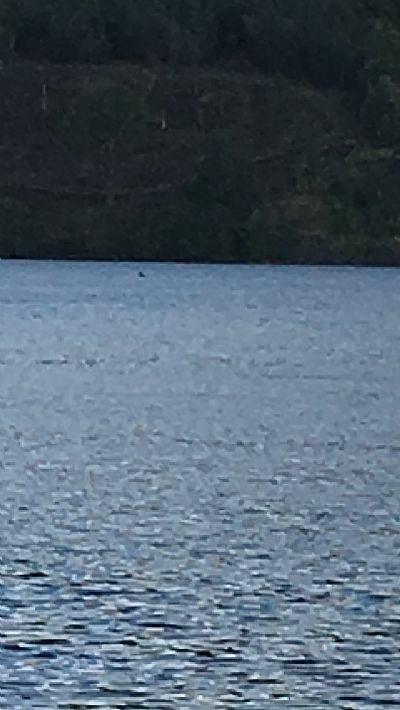 26 March 2018 - Dakota Frandsen, on holiday from Idaho in the United States, reported seeing a large dark shape, roughly 40 feet in length, moving about in the water close to the Urquhart Castle jetty between 3 and 3.30pm. The shape seemed to purposely avoid the boat traffic in the area but Dakota also reported that as a black speedboat came by it seemed to attract the shape's attention which lead it to briefly surface. 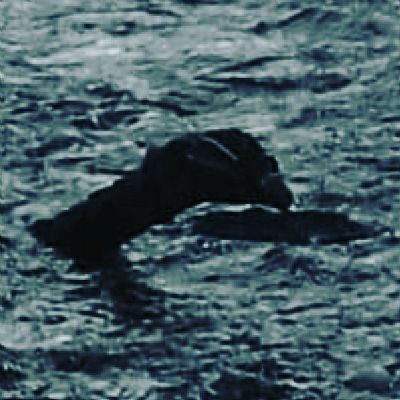 The "skin" of the object was grey in color, almost like that of a hippopotamus and then the the shape start swimming towards to shore opposite the castle before it finally disappeared. Other, similar shapes seemed to also appear but quickly vanished. 22 August 2017 - Mr Stuparich and three friends were out walking from the Dores Inn to Tor Point. As theycame to the shore on the point all four saw something huge in the water. They said it was an unusual shape - it arched out of the water then turned and went down underwater. 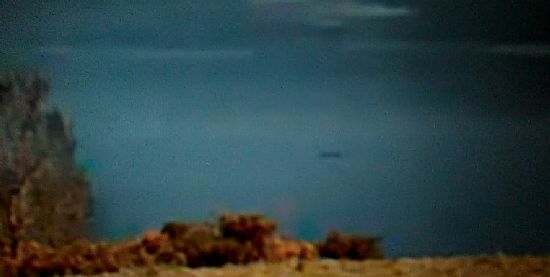 The sighting, pictured below, took place at 3.41pm and lasted about 10 seconds. 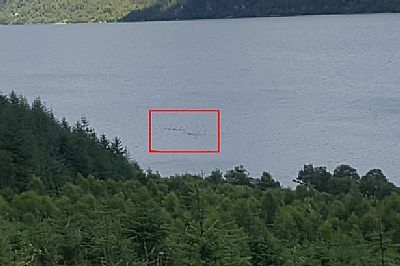 21 August 2016 - Ian Campbell, a government worker from Argyll, was cycling along the west side of the loch near Drumnadrochit with his son and family friend when he pictured two creatures in the loch about 10m in length just out from the shore. 21 August 2016 - on the same day Mr Smith, visiting the area, also saw something very similar. 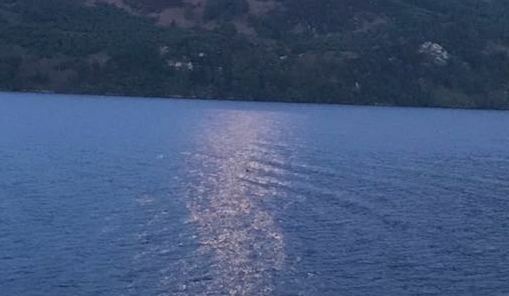 He said that he and his son saw some dark or black shapes moving around in the water near to Urquhart castle. He estimated them to be about 800 yards away but they managed to take some pictures including the one below. 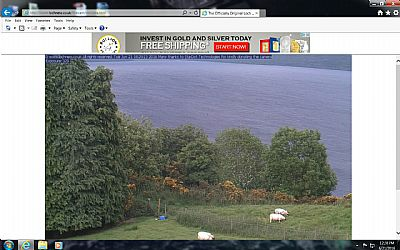 21 June 2016 - Jim from Iowa took the pictures below from the 'Nessie on the Net' webcam while watching it during his lunchtime in the USA. He said that the second picture shows the normal view without the object in it. The sighting lasted 10-12 seconds and he reported that there was no boat activity in the area at the time. 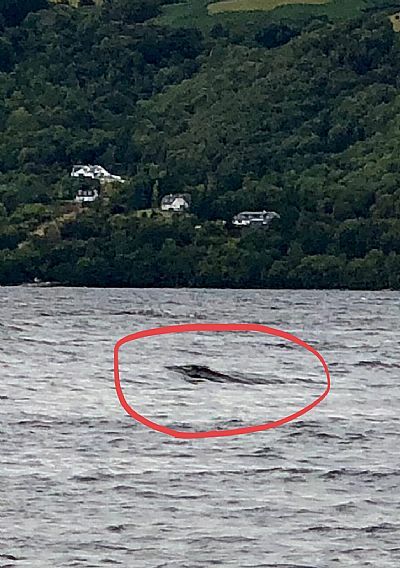 15 September 2015 - local man Conor Mckenna was driving along the loch side one mile south of Urquhart Castle at approx 12.45 hrs when he saw a dark coloured 15-20ft long object in the water about 250m from the shore. he had a clear view for 6-7 seconds before the object submerged, leaving a small wave here it had been. 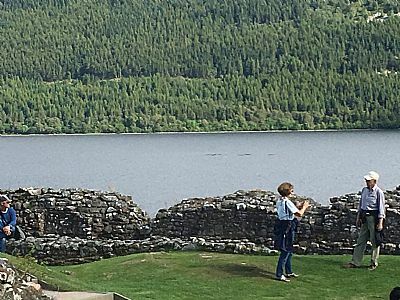 22 April 2015 - a couple on visiting Urquhart Castle reported seeing a large dolphin sized shape emerging from the waters at 12.15pm. It came out 4-6 times and was confirmed by another unrelated person who saw the same thing. 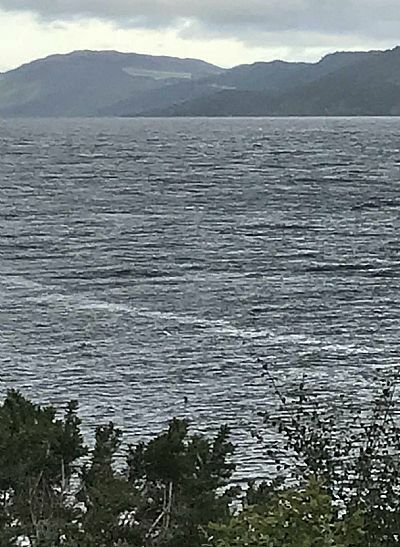 20 June 2014 - Terran Woolley from Kansas reported seeing a disturbance on the water to the north of Urquhart Castle at 3pm.There was no boat traffic nearby at all. 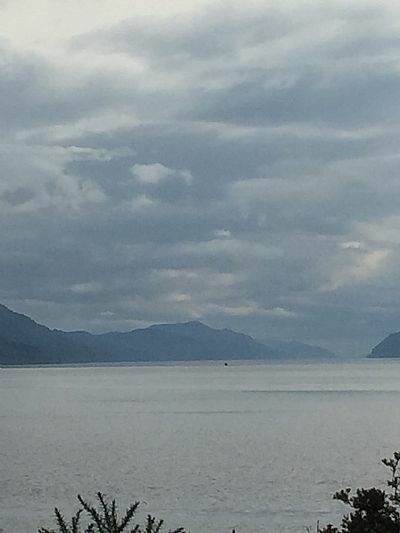 2 May 2104 - a local gamekeeper reported seeing someting creating a 50 foot long wake at 8.30am going from the north to the south side of the loch near Dores - he saw it from the top of Dores hill. There were no boats in the vicinity and the sighting lasted about a minute. The man said it was "an amazing sight. I travel this road to Whitebridge daily and have never seen anything like it"
April 2014 - Bjarne Sjöstrand of Stockholm reported this image from Google Earth as a result of seeing the Apple images that were so widely publicised. Bjarne has done some analysis and has concluded that the object is around 31m long. This puts it at the same size as the Apple image but it doesn’t appear to be moving at speed in this shot. The part of the loch the picture is taken at is known as Horse Shoe Scree and is on the opposite side from the main road running the length of the loch. The image (seen below) can be viewed on Google Earth and Google Maps at 57°10'25.30"N, 4°36'53.53"W. This image won the 2014 William Hill Award. 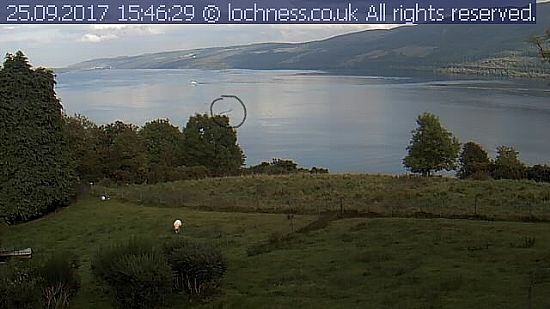 In early 2013, he took some video footage of a large disturbance in the water from a lay by beside the loch. It was a very short timeframe. 6th June 2009 Douglas MacDougall spotted a hump in the water near the Clansman Hotel. 22nd May 2008 Gordon Holmes from Yorkshire was undertaking his new expedition (Net Nessie 2008) when he recorded an unexplained sonar contact 60 feet down in the Loch. During his stay he went on to record a further two contacts at various points in the loch. 8 February 2008 Brenda Ellis from Foyers took four snaps on her mobile phone of a creature moving north in the water near Inverfarigaig on the south side of the loch. She said the creature was black/brown in colour and was spotted moving in the water for 10-15 minutes. 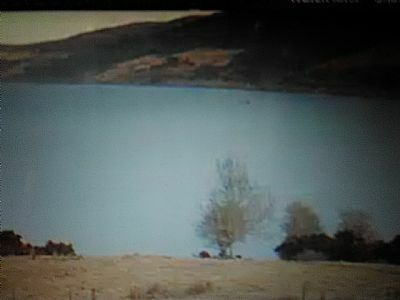 26 May 2007 Gordon Holmes of Shipley, Yorkshire, took a video of an unknown creature at 9.50pm from a layby at the north end of the loch. He described the creature as 4-6ft long , swimming at around 6mph. 28 January 2006 Mrs Murphy from Inverness was driving south at 11.30am on the A82 near the youth hostel at Allt Sigh. 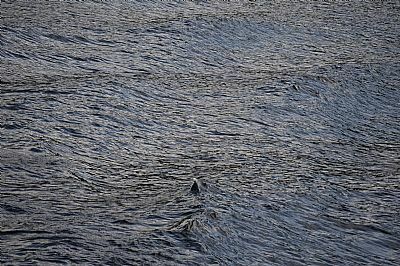 She stopped as she saw a black cone shaped creature circle round in a whirlpool like motion about one quarter of the way across the loch. Familiar with the loch she said that she had never seen anything like it before. The sighting lasted 4 minutes and the weather conditions were clear with no wind. 9th September 2005 A retired Master Mariner was cruising just south of Urquhart Bay in a Caley Cruisers boat at a speed of 9 knots when they were overtaken by an unknown object which was between them and the south shore. Unlike anything any of the three people on the boat had seen before, the sighting lasted several minutes with whatever it was only disappearing as they moved the boat towards it. A regular boat user on the loch, the captain said that there was no rational explanation for what they had seen. 28th August 2005 Kelly Yeats and Neil McKenzie from Bridge of Dee were staying at Foyers Bay House when they saw a ‘long necked, curved headed’ creature in the loch at 8.30 in the morning. The sighting lasted 10 minutes. 11th August 2005 Mr Bell and his family from Newcastle watched what they described as the head of a large animal move through the loch at 6pm in the evening. The family, who were on the veranda of a holiday lodge at Foyers at the time, said that the head was larger than that of a cow and was about 1/3 of the way across the loch. Regular visitors to the area, they were convinced it was not a boat wake or wave movement that they had seen. 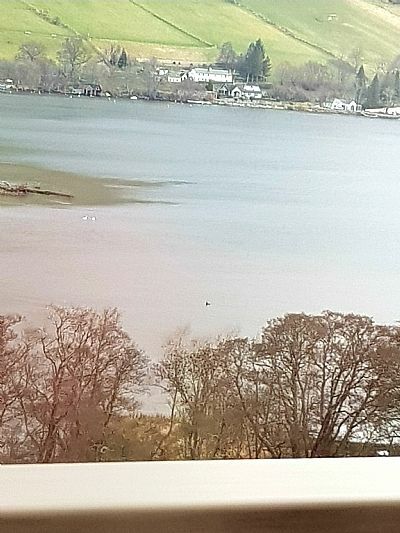 11th April 2004 Two holidaymakers were walking along Dores beach at around 10.00 am when they noticed an object in the water. It was there for around 5 minutes moving very slowly from left to right. 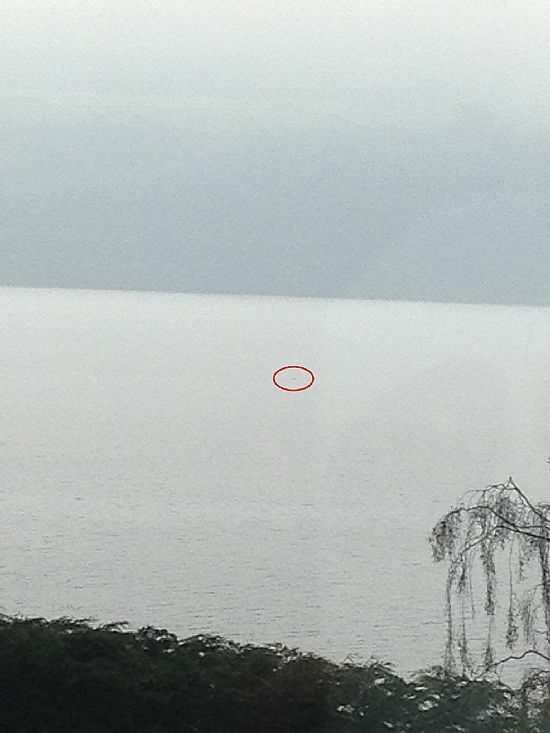 The object was around 200 to 300 feet away and was no more that 2 or 3 feet out of the water. 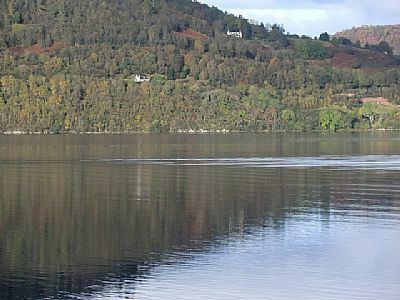 1 June 2003 The captain of local cruise boat “The Royal Scot” reported seeing a fast moving v-shaped wake on the surface of the loch at 2.10pm. 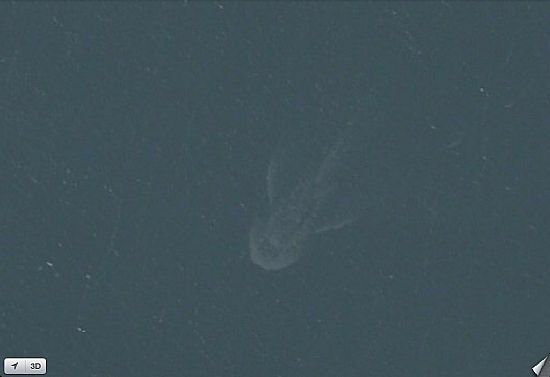 The water was very calm at the time and the wake was said to be about 1000 ft long with the creature at the head of it travelling at about 35mph. 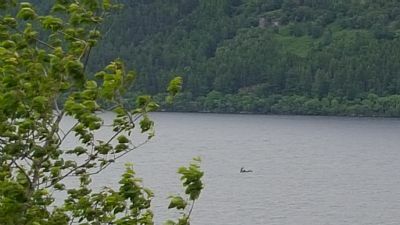 23 May 2003 Local coastguard skipper George Edwards saw a six foot long creature surface for about 2-3 minutes close to Urquhart Castle at around 1.00 in the afternoon. He said it was dark grey in colour and had a rough texture to its skin – it came out of the water about 18 inches. 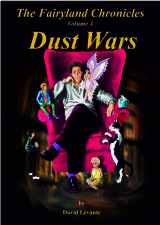 17 October 2002 - Ms Hilden had a nine second sighting of an unknown creature in the early morning. 10 August 2002 A man travelling on the A82 towards Fort Augustus saw an unknown object cross the water at speed. It created a substantial wake and was above the water for about 15-20 seconds. 27 February 2002 Two local residents of Dores at the north end of the loch saw something move quickly from Tor point to the Clansman Hotel. They said that it created a wake and there was definite splashing from the head of whatever the creature was. 21 November 2001 At 2pm two local women saw a dark hump in the loch out from Urquhart castle. Dark grey in colour, the hump was stationary for 1-2 minutes before disappearing below the surface of the water. 12 August 2001 A man on holiday from Duns saw a black hump in the water near the Invermoriston Caravan and Camping Park. It appeared for 3-4 seconds and was also seen by his grandson. 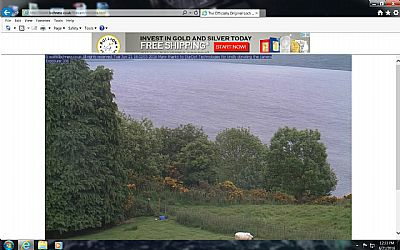 5 August 2001 Andrew Bain from Aberdeen was watching the loch from Fort Augustus at around 9pm. He saw a large black form rise from the water and remain visible for around 5 seconds. A smaller black hump then appeared close to the first before disappearing. 10 January 2001 Dougie Barbour from Glasgow took pictures of a wake moving against the current from a layby near the Clansman Hotel during the mid-afternoon. 4 September 2000 Fort Augustus man saw two humps in the water close to Cherry Island at the South end of the loch. 23 August 2000 Robert Pollock of Glasgow filmed a creature in the water for 18 minutes in Invermoriston Bay. It moved about and then disappeared below the surface. 3 August 2000 11.15.a.m. 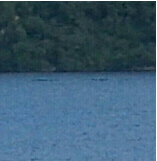 Two students touring the Highlands saw curious v-shaped wake moving through the water, off Boleskine and near Foyers. 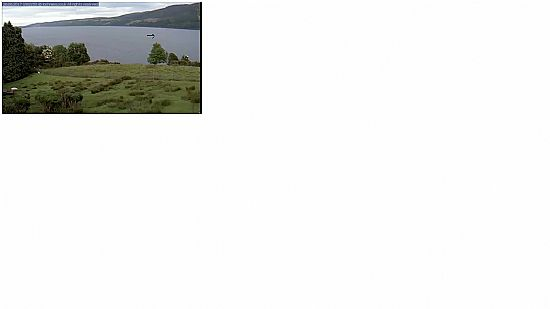 13 July 2000 Melissa Bavister and Chris Rivett, on holiday in the area, took a picture of a large double humped object in the middle of the loch. 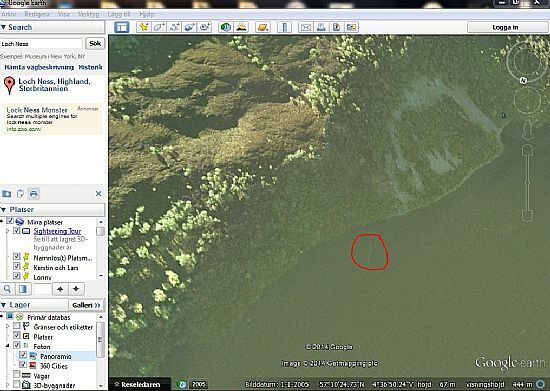 22 June 2000 1.00 p.m. David Myers saw a 'triangular shaped mound' rise out of the water to a height of about two feet.. Sighting occurred from loch side close to Clansman Hotel. 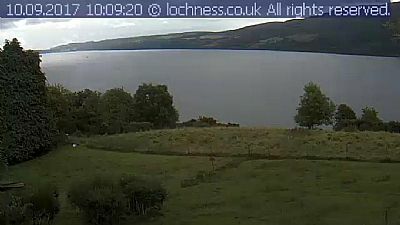 20 June 2000 Gavin Joth, a Canadian watching the Loch Ness webcam, snapped a number of pictures of a head and neck type object crossing Urquhart Bay. 17 February 2000 Allan White and family, from Australia were looking out over the loch from the A82 from Inverness. 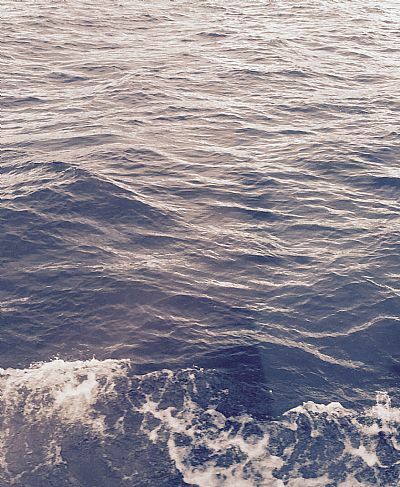 They saw a dark shape emerge on the water about ½ a mile away. 12 February 2000 James Dalton. While visiting the loch on a day trip from Aberdeen saw an unusual movement of water, as something broke the surface near Horseshoe Scree. 8 January 2000 John Catto, a former soldier saw a fifteen foot long object in the water as he made his way to Drumnadrochit. The object was about five feet tall. 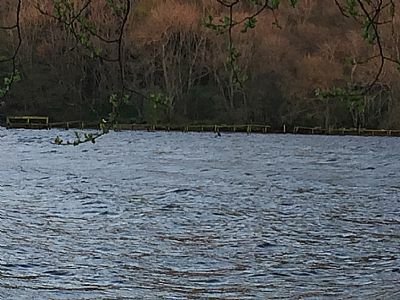 3 January 2000 Melvin Hughes, his wife and two children.. At a distance of about ½ a mile saw from above Foyers from picnic area a black neck and head emerge from the water mid-way across the loch and cause a water disturbance as it progressively moved in the water.